I encourage you only to proceed with great caution. Please know I don’t write this to cause you any pain. I write this post so that people who advocate abortion can read what it is exactly they are advocating. I remember thinking it looked like a regular vacuum cleaner with a glass canister which allowed me to see the contents. I clutched the sheet that covered the vacuum in my hand and stood staring at it for quite some time trying to decide if what I as seeing was real. I just couldn’t comprehend it. Why would any one leave that there, like that, for a patient to see? I kept thinking, surely this was a mistake and any minute an apologetic staff member would come in and take it away. Someone was careless and just forgot to clean up after themselves. Yeah, that was it. Why else would I have been left alone in the room with that thing? The glass container was half full and splattered with blood. Even the tube that fed into the container was crusted with blood. What I saw inside the collection container defies belief, little baby parts swimming in a bloody muck. All those graphic photos you’ve ever seen of tiny dismembered arms and legs are accurate. Only this wasn’t just one set of tiny arms and legs… this was more than I could count. This wasn’t just one baby that was aborted and some careless worker forget to remove from the room. This looked like all the babies that had been aborted that day. All together in one glass container, swimming in a gruesome soup of blood and bits. They hadn’t even bothered to clean the equipment between patients and I suddenly realized they had every intention of using the same filthy equipment on me. 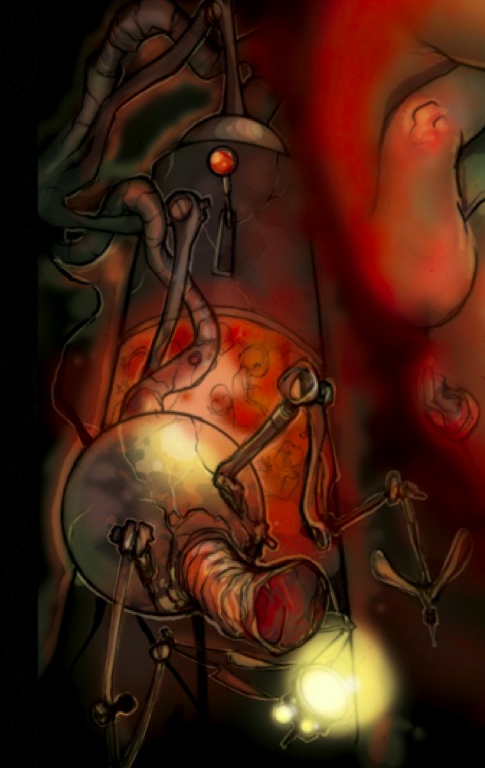 The Abortion Machine depicted above was my idea of a nightmare vision, the sort of thing that might enter the head of someone who had ingested too much overheated pro-life rhetoric. This made for stunning, sobering reading. Yeah. There are few blog posts I read that make me cry–this one did. The other piece of this is that I followed the link (because she names the clinic) and it was the clinic that kids from my high school would have likely gone to…about 1.5 hrs from where I grew up. Thank you both; and thanks to Ms Fernandez, as well. Overwhelming. These days it takes courage just to write describe reality in plain language. God help us all. Too much. Had to stop reading. But, thanks.